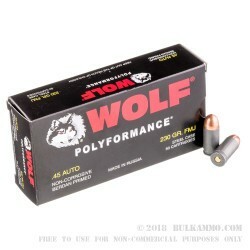 This steel cased 45 ammo by Wolf is an affordable alternative to the higher priced brass cased ammo. 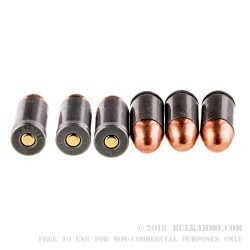 Each round features a polymer coated steel case that is berdan primed and non-reloadable. The polymer coating helps to ensure that the ammo cycles reliably through your firearm. Each steel case is loaded with a bi-metal 230 grain FMJ projectile with muzzle velocity of 850 feet per second. This ammo was manufactured in Russia at the Tula Cartridge Plant. The steel components make this an affordable option for your next trip to the range, but make sure to check your local range rules to make sure they allow steel ammo before you buy in bulk! Ammo was ok, but lots of smoke and smoke! 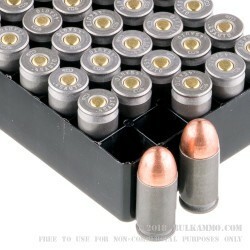 The ammo was pretty ok, i shoot a 1911 45acp, so went to the range with a box. 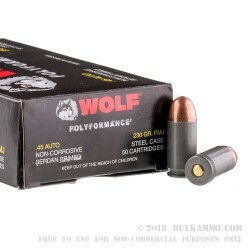 A: Hello Alf, This Wolf ammunition is loaded in a berdan primed steel case.